Mathematical modeling is the art and craft of building a system of equations that is both sufficiently complex to do justice to physical reality and sufficiently simple to give real insight into the situation. Mathematical Modeling: A Chemical Engineer's Perspective provides an elementary introduction to the craft by one of the century's most distinguished practitioners. 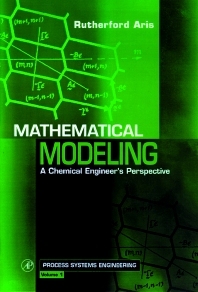 Though the book is written from a chemical engineering viewpoint, the principles and pitfalls are common to all mathematical modeling of physical systems. Seventeen of the author's frequently cited papers are reprinted to illustrate applications to convective diffusion, formal chemical kinetics, heat and mass transfer, and the philosophy of modeling. An essay of acknowledgments, asides, and footnotes captures personal reflections on academic life and personalities. University of Minnesota, Bloomington, U.S.A.